It's no blizzard, but a winter storm is causing problems on area roads just in time for New Year's Eve. A winter weather advisory continues for the D.C. region until 1 p.m. The federal government is open with unscheduled leave. The District government is under normal operations. Thursday's morning's rush hour (for those of us who have to work) was slippery, especially west and north of the District. Laytonsville, Md., and Columbia, Md., received about 2 inches of snow by 10:30 a.m. Herndon, Va., received about a half of an inch. 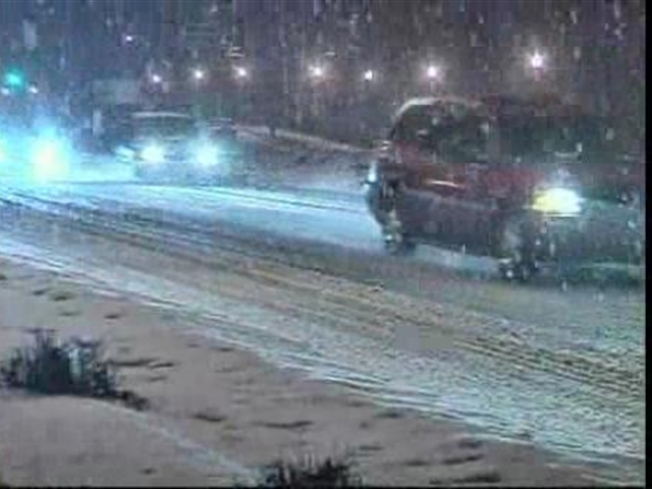 Other parts of the area saw the ever-popular wintry mix, which cause some troubling commutes. Temperatures will eventually rise to 36 or 37 degrees in the District and about 35 degrees in the suburbs, according to NBC4 meteorologist Veronica Johnson. Rain will return to the area at about 7 p.m., and showers could continue through midnight to 4 a.m. Some parts of the area could see light snow mixed in with the rain, Johnson said. Since the ground is already quite cold, roads could become slippery, no matter what precipitation falls. However, road crews should have plenty of time to treat local roads before revelers start heading out to celebrate on New Year's Eve. So partiers shouldn't call off their plans. Be aware of patchy ice on roads and sidewalks, however, as we ring in the new year. Temperatures will drop back down below freezing before the ball drops, and there could be a few slick patches by sunrise Friday. Gain some traction. Remember traction is greatest just before the wheels spin. Gentle pressure on the accelerator panel when starting is the best method for retaining traction and avoiding skids. Drive slowly. Everything takes longer on icy roads. Accelerating, stopping, turning — nothing happens as quickly as on dry pavement. Give yourself time to maneuver by driving slowly. Don't stop if you can avoid it. There's a big difference in the amount of inertia it takes to start moving from a full stop versus how much it takes to get moving while still rolling. If you can slow down enough to keep rolling until a traffic light changes, do it. Minimize brake use on very slippery, icy hills. If further speed reduction is needed, gentle, slow brake application (squeeze braking) is recommended to avoid loss of control. The stopping distance required on ice at zero degree Fahrenheit is twice the amount required at 32 degrees Fahrenheit. To compensate for the longer stopping distances required on slippery surfaces, focus your attention at far head as possible (at least 20 to 30 seconds) and allow the greatest margin of safety to the front.